In the Paris winter of 1999 Camille is 15, Sullivan is 19. Although they love each other passionately, Sullivan wants to go traveling in South America for a year – a plan that fills Camille with despair. At the end of the summer, Sullivan leaves and a few months later he stops writing to Camille. In the spring, a heartbroken Camille makes a suicide attempt. Fast forward four years and Camille is fully devoted to her architectural studies. She meets a well-known architect, Lorenz, who restores her self confidence. She falls in love with him. It is then that Sullivan once more crosses her path. Despite an awkward first encounter, Camille sees him again, picking things up where they left off. She has never stopped loving him; he becomes her lover. Camille, her heart now divided between the two loves of her life must decide what to do next. Mia Hansen-Løve returns following the critically acclaimed Father of My Children with the equally impressive Goodbye First Love (Un amour de jeunesse). Loosely auto-biographical in style, the film deals with what Hansen-Løve has described as the "defining and central" part of her adolescence. The blooming of first love, subsequent heartbreak and renewal are portrayed with a simple directness of stye which nevertheless allow the complexity of emotions to be given full range. Lola Créton (Bluebeard), playing the central character of Camille, gives a subtle performance allowing the audience to embrace the protagonist's growth into maturity and personal liberation. 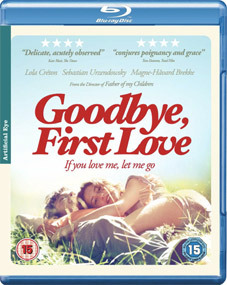 Goodbye First Love will be released on UK DVD by Artificial Eye on UK DVD and Blu-ray on 10th September 2012 at the RRP of £19.99 for the DVD and £19.99 for the Blu-ray.